Section 2.2.1, Lack of Physical Security Controls, notes that “when planning mobile device security policies and controls, organizations should assume that mobile devices will be acquired by malicious parties who will attempt to recover sensitive data either directly from the devices themselves or indirectly by using the devices to access the organization’s remote resources. Section 3, Technologies for Mobile Device Management, gives an overview of the current state of centralized mobile device management technologies, focusing on the technologies’ components, architectures, and capabilities. Section 4, Security for the Enterprise Mobile Device Solution Life Cycle, explains how the concepts presented in the previous sections of the guide should be incorporated throughout the entire life cycle of enterprise mobile device solutions, involving everything from policy to operations. The Appendices provide useful references to supporting NIST SP 800-53 Security Controls and Publications and to other Resources, including Mobile Device Security-Related Checklist Sites. General policy: enforcing enterprise security policies on the mobile device, such as restricting access to hardware and software, managing wireless network interfaces, and automatically monitoring, detecting, and reporting when policy violations occur. Data communication and storage: supporting strongly encrypted data communications and data storage, wiping the device before reissuing it, and remotely wiping the device if it is lost or stolen and is at risk of having its data recovered by an untrusted party. User and device authentication: requiring device authentication and/or other authentication before accessing organization resources, resetting forgotten passwords remotely, automatically locking idle devices, and remotely locking devices suspected of being left unlocked in an unsecured location. Applications: restricting which app stores may be used and which applications may be installed, restricting the permissions assigned to each application, installing and updating applications, restricting the use of synchronization services, verifying digital signatures on applications, and distributing the organization’s applications from a dedicated mobile application store. Mind you, the above are only a few of the points from the Executive Summary of the NIST Guidelines. The Publication is intended for Chief Information Officers (CIOs), Chief Information Security Officers (CISOs), and security managers, engineers, administrators, and others who are responsible for planning, implementing, and maintaining the security of mobile devices. It assumes that readers have a basic understanding of mobile device technologies and enterprise security principles. The NIST Guidelines apply to both organization-provided and BYOD mobile devices. 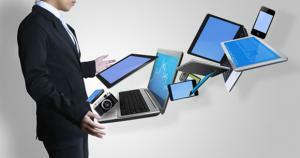 (Laptops are out of the scope, as are mobile devices with minimal computing capability, such as basic cell phones.) The Guidelines recommend on selecting, implementing, and using centralized management technologies. They also explain the security concerns inherent in mobile device use and give recommendations for securing mobile devices throughout their life cycles. So while the NIST Guidelines are a welcome addition to our Knowledge Base on BYOD and the security of mobile devices in general, they may be a bit “over the top” for the small to medium organisation or even for some Government Departments. In the next issue of the Newsletter we look at some specific examples of how the Australian government and private sector are handling the BYOD and security of mobile devices issues.